Lake Michigan has the largest deposit of fresh water sand dunes on earth, and Silver Lake Sand Dunes are the only dunes east of the Mississippi River where you are allowed to ride a private motorized vehicle. From April 1 to October 31, our 2,000 acres of rolling sand dunes offer excitement and adventure to over a million visitors. Our ORV area includes 450 acres and is operated by Michigan DNR and Silver Lake State Park. You can bring your own vehicle or rent one from several businesses in the area. Access is through the State Park, and there is an entrance fee. See the Silver Lake State Park information page or call (231) 873-3083 for more information on fees and State Park ORV rules. 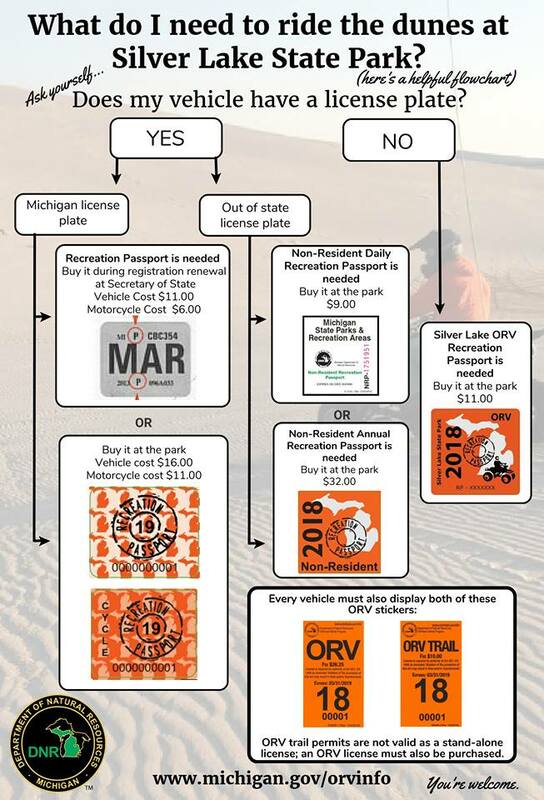 The Silver Lake State Park ORV area has adopted new rules that apply to Sound Levels and Testing, the Voucher System, and Operators and Licensing and Training Requirements (see below). Entry into the ORV area will be denied for vehicles not meeting these standards. A complete list of current rules and regulations is available from the Michigan DNR website. There are directional traffic zones that you need to be aware of. You can find a map of the off-road vehicle area at www.michigan.gov/dnr. Please respect these areas and orientate yourself prior to riding. Silver Lake Sand Dunes can change drastically from day to day, even hour by hour, depending on the severity of the weather. Be on the watch for steep inclines, changing slopes, natural hazards, and/or sudden drop-offs. Review the ORV map prior to riding. Drive throughout the area and be sure to slow down as you approach the top of the hills. Travel the Dunes in its entirety and get a feel for north, south, west, and east. Do not park or stop your ORV on the backside of a hill. This one is simple; if possible, don’t do it. Have someone accompany you so that if an accident occurs, someone is there to seek help immediately. If you know a seasoned operator, have them take you up and show you around first. The beach area has a designated speed limit of 25mph. Other areas do not. Exercising common sense and adopting an operating speed that you can control goes a long way. Extend courtesy to fellow operators and provide a safer environment for everyone involved. A valid driver’s license or ORV Safety Training Certificate must be in the operator’s possession at all times. Persons may not operate any vehicles if their license is suspended or revoked. Learn more. Just like with any major highway or roadway, generally speaking, the more operators you have, the higher the level of risk. You need to be more aware of your surroundings and drive defensively on major holidays and during the peak season, which is typically mid-June through Labor Day. We live in a world full of safety concerns. It is imperative that you follow strict safety measures when operating your ORV. General ATV and cycle riding gear includes: helmet, goggles, gloves, chest protector, riding boots, shoulder guards, elbow guards, long pants, knee pads, and shin guards. Full-sized vehicles require seat belts, roll bars, and eye protection. Do not, at any time, operate your ORV under the influence of drugs or alcohol. Violation of this rule or any others may subject operators to court citation, eviction, and/or vehicle(s) impoundment. Do your homework. Challenge businesses in the community to help you with your experience or answer questions. Look for businesses that promote the “Drive Safe, Know Your Dunes” campaign. *S.A.N.D and its members assume no responsibility or liability for personal injury or property damage arising out of the interpretation or use of information provided in our safety campaign. A static or stationary sound level test will be performed on all types of ORVs. Noise levels will be checked from a 20-inch distance from the exhaust pipe at half the vehicle’s rated RPM or as detailed in the automotive specs SAE J1169, March 92 or SAE J1287, June 86. The maximum noise level permitted under these conditions is 94 dBa, which is the current limit set by the Off-Road Recreation Vehicles Act of Part 811 of 1994 PA 451. All vehicles are required to have a muffler and spark arrester. Mufflers must contain baffles that can be confirmed by inserting a flexible, plastic rod. Generally speaking, the guidelines for testing at “half the rate RPM” will be based on some vehicle similarities. In most cases, full-sized vehicles with “V” configured engines will be tested at 2,500 RPM and all others at 2,000 RPM. Most reverse flow mufflers will meet the spark arrester requirements as will most turbochargers. However, straight-through mufflers, such as glass-pack designs without baffles and mechanically driven superchargers do not qualify as adequate spark arresters. Motorcycles and ATVs will be tested like full-sized vehicles by placing a sound meter at a forty-five-degree angle, 20 inches from the muffler exhaust pipe. In most cases, 80 cc engines will be tested at 6,000 RPM, 125 cc at 5,000 RPM, 250 cc at 4,000 RPM, and 500+ cc at 3,000 – 3,500 RPM. The Motorcycle Industry Council produces a manual detailing the standards ATVs and motorcycles must meet. A muffler that meets Environmental Acoustic Reduction (E.A.R.) standards may be considered as a viable solution for motorcycles. Most ATVs with unaltered, factory-equipped exhaust systems, which have been properly maintained, will meet the requirements. Those vehicles that have been manufactured for “closed track” use only, such as many motocross or “dirt-bike” motorcycles, will most likely not meet the requirements. This is also often true where after-market installations have altered the original exhaust system in attempts to gain additional horsepower. Vehicle operators will be required to have a valid driver’s license, except for riders 12 years of age or older who possess a valid ORV Safety Certificate. These riders may only operate ATVs and motorcycles as the training certificate specifies, and they must be under direct supervision of a parent or adult guardian. Driver’s license or ORV Safety Training certification must be presented upon demand. Safety is a significant issue at the Silver Lake Sand Dunes. All vehicles entering the Dunes must have mounted to their front bumper a 10-foot mast holding an international orange flag. With the rolling terrain, spotting a flag coming over a hill can avert collisions. The flags and masts are sold at many area businesses. Vehicles must have seat belts, and passengers must be belted at all times. Drivers using their own vehicles should reduce the air pressure in their tires to 10 pounds per tire. Park rangers constantly patrol the park, and tickets are issued for violation of park rules or unsafe driving practices. Be aware that the Dunes are constantly changing. A rolling hill that you drove over in the morning could be a steep cliff with a dramatic drop off by afternoon. Have fun and please drive safely!